The MCU is located behind the right front kick panel. Remove MCU mounting bolts and disconnect wiring harness connector. Do not bend connector pins when removing. Reconnect harness to MCU and replace mounting bolts. Remove air cleaner and disconnect solenoid harness connector. 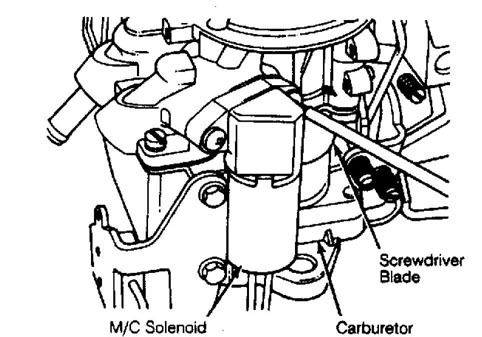 Remove retaining screws and remove solenoid from carburetor. Coat rubber seal, on end of solenoid stem, with silicone grease or light engine oil prior to reinsertion. Using a new gasket, replace solenoid. Reconnect wiring harness and replace air cleaner. Disconnect wire connector from oxygen sensor. Remove sensor from exhaust manifold. Clean threads in manifold. Coat threads of replacement sensor with anti-seize compound. Install new sensor in exhaust manifold and tighten to 32-38 ft. lbs. (43-51 N.m) . Reconnect wire connector.